Early diagnosis and life-long treatment of FH reduces the risk of premature CHD. FH should be suspected when untreated fasting LDL cholesterol levels are above 5.0mmol/L. Secondary causes of hypercholesterolaemia such as hypothyroidism, diabetes, nephrotic syndrome and corticosteroid use should be excluded first. Family history of premature heart disease and/or high cholesterol in first degree relatives should be explored. Family members should be identified through drawing the family pedigree, or family tree using standardised pedigree terminology to document, where possible, at least a three-generation pedigree. 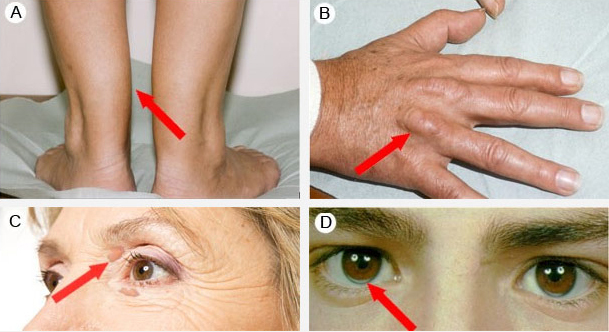 Although not present in many individuals, untreated patients can present with cutaneous deposits of cholesterol, called xanthoma, in the Achilles tendon (A), the extensor tendons of the hands (B) and/or on the eyelids (palpebral xanthelasma) (C). Arcus cornealis (D) before the age of 45 is also a significant indicator to strongly suspect FH. The absence of these clinical signs does not exclude FH, especially in younger patients. The Dutch Lipid Clinic Network Score (DLCNS) is a validated set of criteria based on the patients family history of premature cardiovascular disease (CVD) in their first degree relatives, their own CVD history, their untreated lipid levels and physical signs such as the presence of tendon xanthomata or arcus cornealis prior to the age of 45. The subsequent score categorizes patients by the likelihood of Familial Hypercholesterolaemia (FH). For more information see: ACGP: Detecting familial hypercholesterolaemia in general practice, 2012. *The calculator is optimised for current versions of common browsers (IE 7 onwards, Chrome, Firefox 3.6 onwards, Safari 2.04 onwards). to assist in the risk stratification of a patient where severe pathogenic mutations are identified. It is important to note that even if a genetic test is performed and a mutation is unable to be found, this does not automatically exclude FH. Approximately 20% of clinically definite cases of FH will show a negative result.